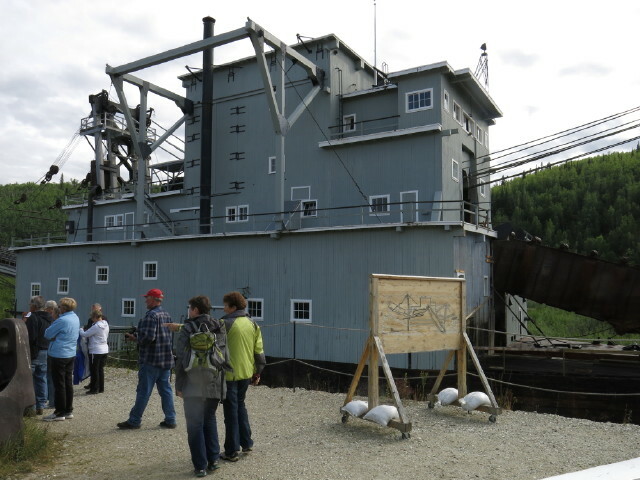 We finished our stay in the Yukon by touring a Parks Canada National Historic Site known as Dredge 4, the continent’s largest Gold Dredge. 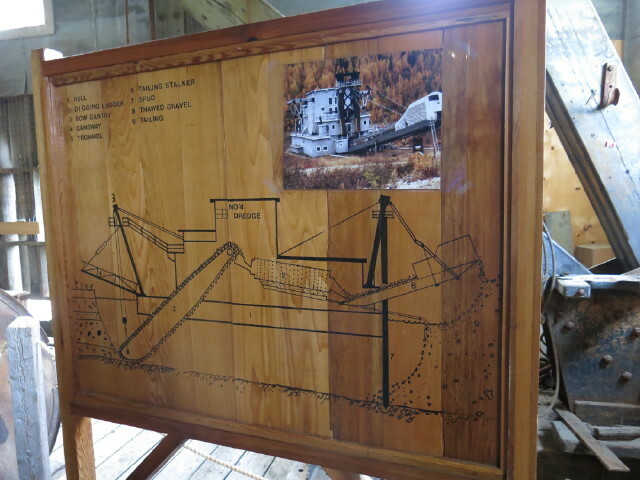 The first two photos show the 10 storey high dredge built in the early 20th century. The second photo shows a drawing of how it operates. It is anchored in a suspected gold bearing vein and it uses large connected buckets to dredge up the soil/rock and process the material through various mechanical operations that separate out the heavy gold bearing rock and dispose of the residual rock tailings. It would move along at the command of the captain in the water bearing land moving hundreds of feet in a season. The Dredge was built at a cost of $500,000 and produced enough gold in its first year of operation to repay the lenders. 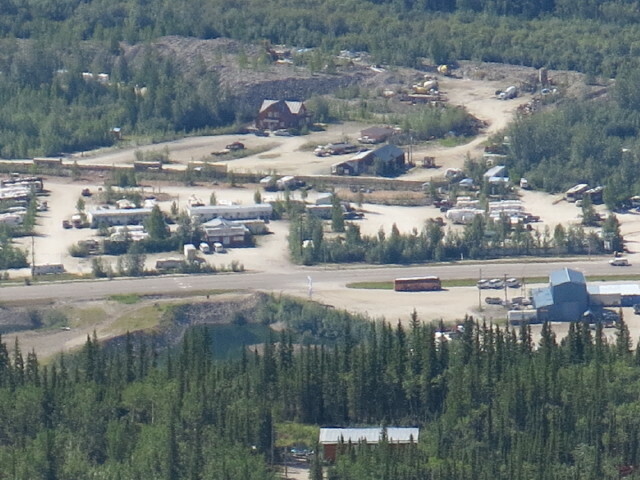 The mining season is far shorter in the Yukon running roughly mid-May to early October. The investors really were taking a risk when putting up the money to build it. 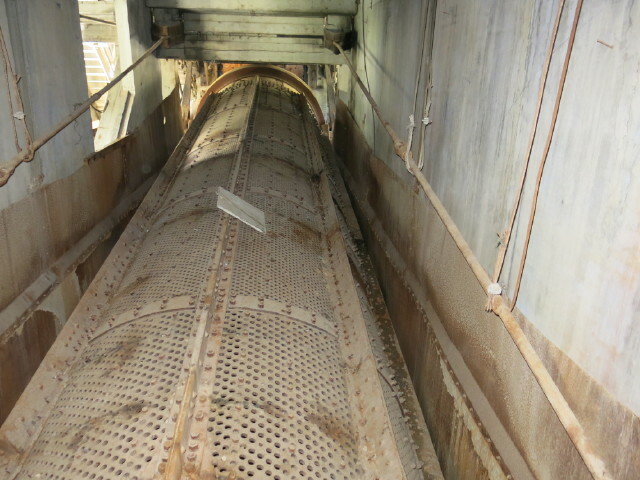 The large drum shown in the next photo is the location in the Dredge where the gold bearing rock passes through various sized holes to be captured and eventually refined. 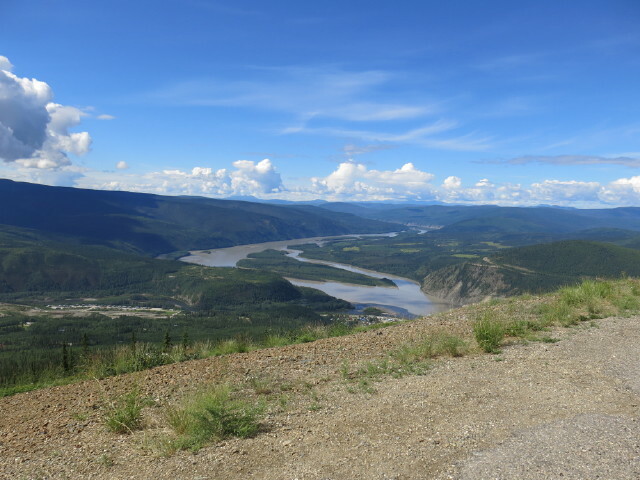 After viewing the Dredge we climbed the Midnight Dome road to this area overlooking the Yukon River and Dawson City. This is the location, where on June 21st, the locals and partiers go to see the sun come down to the horizon then rise again without setting. You can see quite a distance from this peak. The next picture shows our campground where we had stayed almost a week. 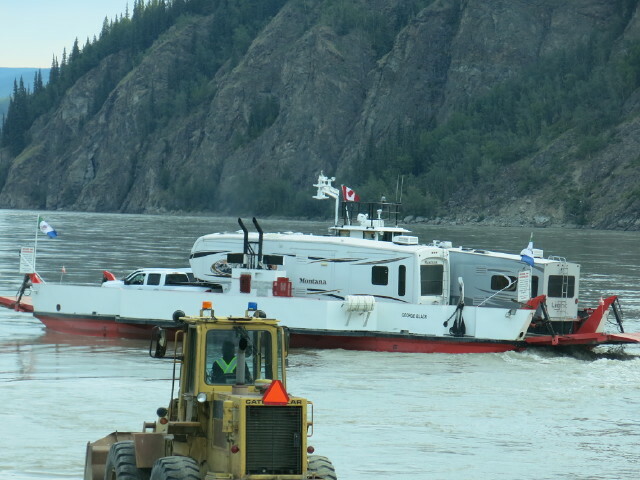 The last photo is one of the small Yukon Ferry that takes vehicles across the Yukon River to begin a 14 km (9 mile) climb up from the river on the Top of the World Highway. Here the roads dramatically change to a narrow, mountaintop route. Where most mountain roads wind their way through the valleys, this highway is unique in that it moves mountain top to mountain top. 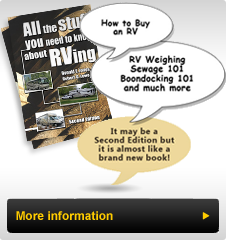 The views are spectacular, the drop offs are straight down and the road is narrow, often unpaved and winding. The short spruce tree rows create "carpet ripples” in the valleys. The views are great but are difficult to capture in a photo (so we don’t have any). Enjoy these and we’ll continue with the next section in Alaska.